ongoing development suggestions we were given! Describe movements when you are dressing the child. Draw attention to new, colurful items, eg. vegetables, packages, magazines etc. Avoid constant radio and T V sound input which drowns out meaningful stimuli. Introduce to different things early - floor - cold and hard: sounds of bathroom where walls echo running water etc. Use mashed potatoes, sticky food for tactile awareness. 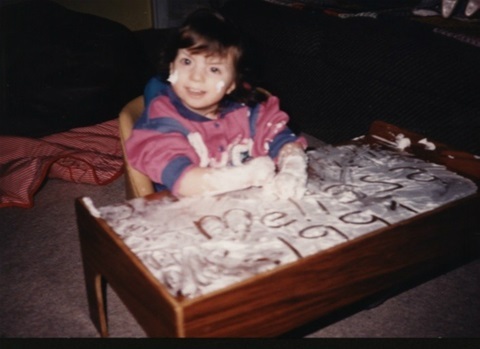 As you can see from the photo we used Dad's shaving cream (after checking carefully its ingredients) Melissa had such a neat time as you can see and we did not have any problem of her putting it near her mouth! she was really happy playing with this - a very special memory. Pass jars containing strong smelling substances under childs nose eg vinegar, onion, cinnamon, perfume etc. I am hoping my sharing our experience and these tips we were given can help someone else!